This post was developed in partnership with Bayer, as part of an Influencer Activation for Influence Central. 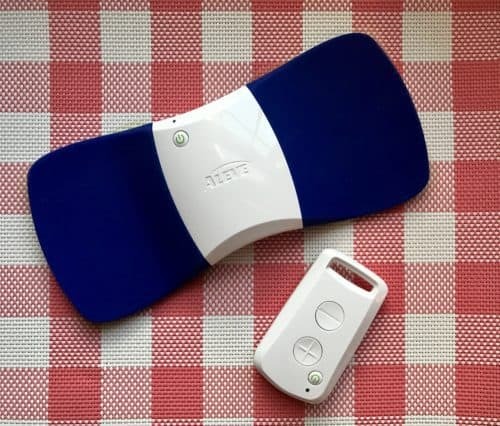 I received the Aleve® Direct Therapy TM TENS Device and compensation to facilitate my review. Our backs sure don't have it easy. Every day between household chores, work and exercise, we put strain on our lower backs which can lead to lower back pain. If you have ever experienced lower back pain you know how difficult it makes carrying out even the simplest of everyday activities. I know that for me, when my lower back pain strikes, it can stop me right in my tracks. I have suffered from lower back pain on and off for over 5 years. Whenever I visit the doctor for the lower back pain they send me home with pain medication. Sure the pain medication helps provide some relief, but it doesn't completely alleviate the pain. Plus, I don't want to have to take pain medication everyday to be able to function and enjoy my life. Aleve, a trusted name in pain management, recently introduced the Aleve Direct Therapy TENS Device. 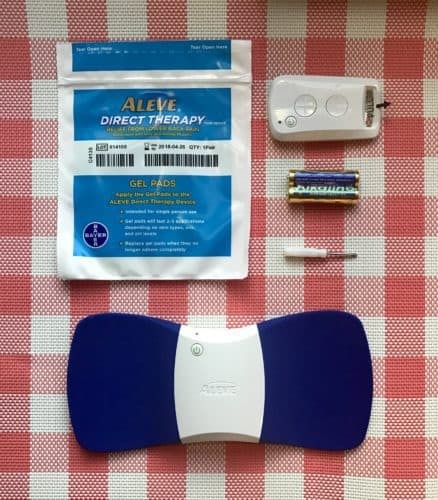 The Aleve Direct Therapy TENS Device was designed specifically to provide relief from lower back pain. The device uses Transcutaneous Electrical Nerve Stimulation (TENS) to help relive pain. Clinicians theorize that the way TENS units provide pain relief is two-fold. The electric stimulation provided by TENS blocks the transmission of pain and stimulates endorphins, our body's natural pain-reducing chemicals. When I heard about the Aleve Direct Therapy TENS Device I was eager to try it myself. Once I got the device home and read the manual I was able to quickly get started. The device came with everything necessary to get started, including batteries and the screwdriver needed to put in the batteries. After putting in the batteries, I opened and attached the gel pads as indicated in the instructions. The device stays attached to the lower back via these gel pads which have a sticky quality to them. Now I was ready to begin my first treatment. Using the device is as simple as placing the device on the lower back and turning it on. The treatment intensity can be adjusted easily using the wireless remote control. During the treatments I feel a deep tingling sensation in my lower back. It is not painful or uncomfortable at all, I enjoy the tingling sensation as it distracts me from the pain I was experiencing. I appreciate the Aleve Direct Therapy TENS Device's sleek and compact design. I can wear it under my clothing, making it easy to have several 30-minute treatment sessions throughout the day. Additionally, the wireless remote makes using the device discreetly even easier – no wires or fumbling with the device is necessary to start a treatment session. Being able to alleviate my lower back pain and get back to my everyday routine, without the use of medication, is a win in my book! 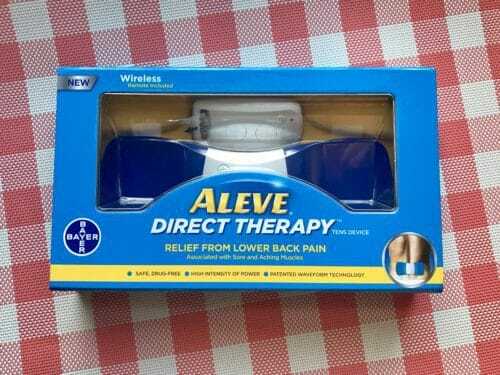 I will absolutely continue to use my Aleve Direct Therapy TENS Device whenever my back pain strikes. 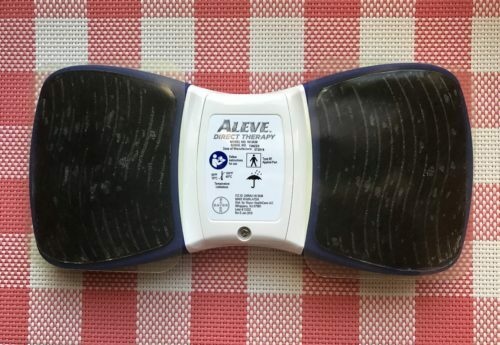 The Aleve Direct Therapy TENS Device can be found online as well as in store at major retailers nationwide in the Analgesics aisle near other topical pain relief products. Very interesting!! TENS machines have been around for a while for muscular pain but not so readily over the counter and at a reasonable price!! Im curious if this is the same therapeutic level as the ones from health stores? I know someone who uses this, and they love it. They use it all the time! It is hard to know how to handle chronic pain, and get safe and true relief, this is a big help for some people, worth a try! wow thats an awesome pain reliever machine. i am so tired of having painkillers which don’t work and so was looking for something new like this one. its awesome product. I have used TENS units before and saw this product on the TV. It looks like a really interesting way to get the TENS relief without spending a ton. My FIL had a very old TENS unit and it looked like a torture device from the Cold War. lol. This looks much less scary. i suffer from lower back pain alot,this would help out alot. I purchased a TENs device after rehab because in rehab that electricity REALLY helped me. This is something I would look into if you are having issues. i have 2 tens units from the dr. i dont have one like this. i was looking at one of these to try on my dogs for her back, but it wont stick, will have to come up with someone to use it on her back. they have tens units for dogs but not the portable ones. they really do help. I’ve been thinking about getting this for my husband. I have never tried this and I am on pain medication and also have a pain patch, but I am still in pain. They don’t want to operate again in fear of paralyzing me so I have been looking for something to help.